Characterfully part of the Occitanie region in southwest France, the hamlet of Pinet sits six miles inland from the unusual coastal zone of a saltwater lagoon, the Etang de Thau. In spite of a modest population of 1,300, this is the heart of the Picpoul de Pinet AOC and so has a disproportionately high concentration of winemakers who specialize in the fashioning of Picpoul – once the favoured style for Emperor Napoleon III. Regionally distinctive, this premium white wine is made with a lesser-known, golden-skinned grape originally called Piquant-Paul, later as Picapulla, and finally now, Piquepoul Blanc. Referencing the grape’s high levels of acidity and mineral accents, Picpoul’s name translates as ‘stings the lip’ – though it doesn’t really, of course! Historically, this lively fruit was blended with another obscure variety, Clairette, creating a tangy wine style called Picardin – millions of liters of which were shipped northwards along the networks of canals to Paris each year. Susceptible to various pests, the vines fell out of vinicultural favour in the late 19th century. Able to thrive in sandy Mediterranean soils, Picpoul Blanc is once again a resurgent variety in the coastal vineyards that surround Pinet. Pinet is also home to the cooperative Cave de Pomerols. Founded in 1932, this group now boasts 350 growers who tend to over 800 hectares of highly productive vineyards in a landscape that is basically a chalky-clay plateau, rich in limestone, quartz gravel, and otherwise covered with Garrigue. Lining the coast, this indigenous vegetation is made up of small aromatic bushes, which like the local grapes, have gradually adapted to thrive in the near-drought climate of summertime. Though challenging, these growing conditions are fortuitously punctuated by late season humidity, thereby encouraging the fruit to plump up and reach full maturity before harvest. 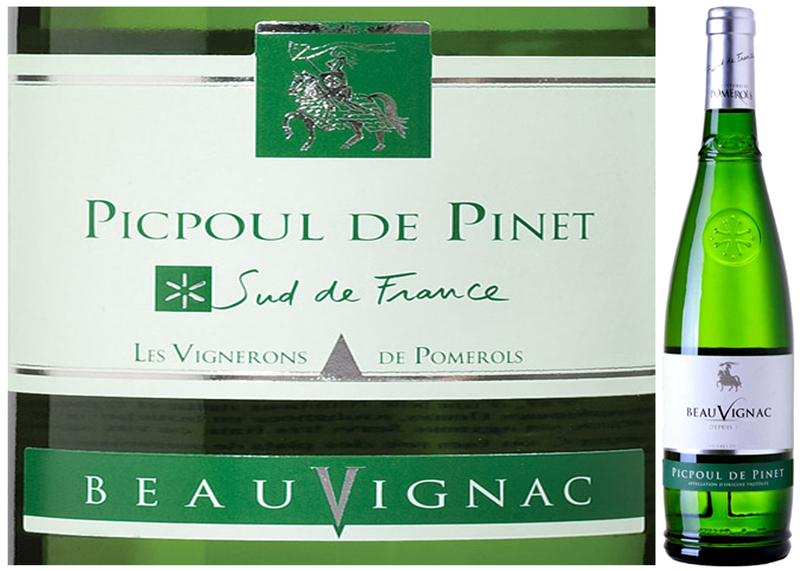 As in this week’s DéClassé recommended bottling of Beauvignac Picpoul de Pinet 2016, the traditional varietal white wine style is dry and citrus-scented. It also has a long-standing reputation for being a perfect complement to shellfish – with the wine’s acidity balancing the saltiness of the food. However, Picpoul is generally food-friendly, as well as, fulfilling when served alone as an apéritif. Don’t expect a big-bodied white wine here, rather be prepared for a delightful succumbing to its beguiling lightness and verve. A very lively wine style with lemony overtones of citrus fruit, pleasantly refreshing grapefruit flavours and a hint of minerality on the tangy finish. It’s an ideal partner with seafood, grilled fish, rich and savoury cheeses or salty charcuterie. As a signature example of both Spanish modern and old school winemaking methods, this fresh-fruited red represents the vanguard for well-made table wines in Spain’s blossoming, quality revolution. Here in the extremely hot wine country around Alfaro, it’s a desirable combination; deftly pairing innovation with deeply rooted tradition. It is modern in that the updated production style of minimal handling and filtering helps to preserve the brightness of the wine, balanced with a soft and integrated presence of Oak. The old school facets are a blending proportion of 40% Garnacha Tinta (Grenache) into the 60% Tempranillo base, as well as, incorporating small batches of finished wine from the previous vintage (max. 15%). Both are typical in Rioja Baja, the most prolific of the 3 La Rioja sub-regions – home to this week’s DéClassé featured wine from the renowned vintner, Bodegas Palacios Remondo. Winemaker and visionary figure, Alvaro Palacios, has for some time now been making news in the wine world with his influential strategies of promoting the development of quality over quantity. In 2015 he was the news, having been declared Decanter Man of the Year by the well-regarded journal. It’s a crowning juncture in a key transition period for this cutting edge winery that purposefully dared to cut output from 200,000 cases of unremarkable bulk wine down to 50,000 of refined grades – a business risk that’s now paying off. 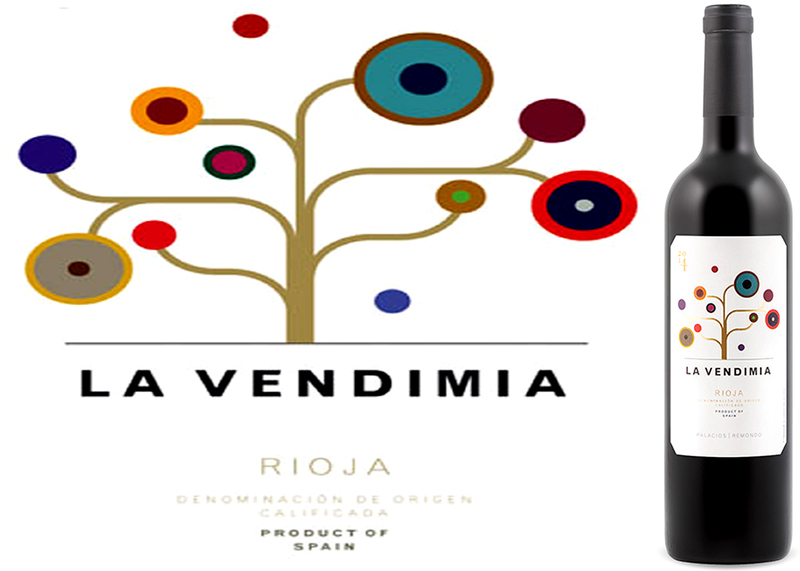 La Vendimia (‘the harvest’) is a solid version of a Spanish Joven designation; a decidedly young wine that has been barrel-aged for less than six months. Here on the arid, rocky slopes of Monte Yerga, the Bodega draws fruit from 40 hectares of 10 – 40-year-old vines; grown organically without irrigation, at some of Rioja Baja’s highest altitudes (+550m). Along with the varietal bottling of 100% Tempranillo, famously fashioned in the other two La Rioja sub-regions of Alta and Alavasa, this is as close to a perfect, informal sipping wine that Spain currently produces. By design it’s meant to be enjoyed young and year-on-year it continues to be offered at a fair price-point. That’s still very much the case! Consistently well made, this cherry-coloured, fruit-driven wine reveals aromas of blackberry jam, raspberry and a hint of Garrigue (fragrant, wild Mediterranean shrubs). Enjoy this on its own or with hearty fare such as Ratatouille, lamb ragout, or pretty much most BBQ-roasted dishes. As early as the 6th century, the monks of the Abbey of Saint-Maur had begun to cultivate, refine and gradually proliferate some of the white wine yielding grapes that now thrive in the chalky soils or pierres de tuffeau of the Loire Valley. 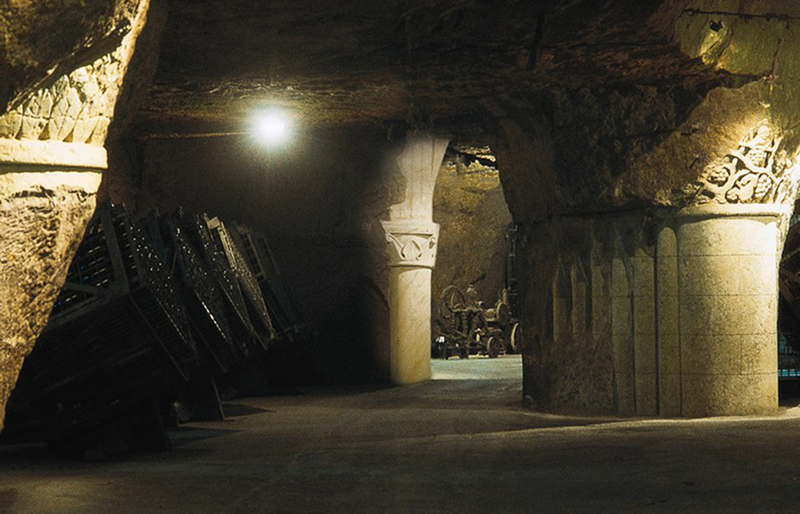 This underlying, light-coloured, fine-grained and fossil-laden limestone also has a long history of use as a quarried building material, giving the Loire’s photogenic cathedrals, châteaux, and towns, their distinctively luminous personality – both above and below ground, as in the surprising, 5 mile-long cellar at Maison Bouvet Ladubay. It’s actually an excavated cave, first begun a millennium ago by another monk order, Saint Florent, who used the stone in the 1040AD construction of their Abbaye La Belle d’Anjou. Now invested with an artist-commissioned installation of 35 architectural clusters, including carved pillars, capitals and arches, the Underground Cathedral is an ode to 10 centuries of skill and intricate labour by the Loire’s inspired stonemasons. It’s also a contemporary contribution to the storied, natural and cultural landscape between Sully-sur-Loire and Chalonnes; declared a UNESCO World Heritage site in 2000. Finished using the Méthode Traditionelle, this is the non-Champagne descriptor for a somewhat involved, in-the-bottle, secondary fermentation process that’s employed to create premium grades of vins mousseux (sparkling wine); originating in one of eight approved AOC’s in France for the wine style that were established in the 1970’s. The best known of these include Crémant d’Alsace, Crémant de Bourgogne, Crémant de Limoux, and Crémant de Loire. 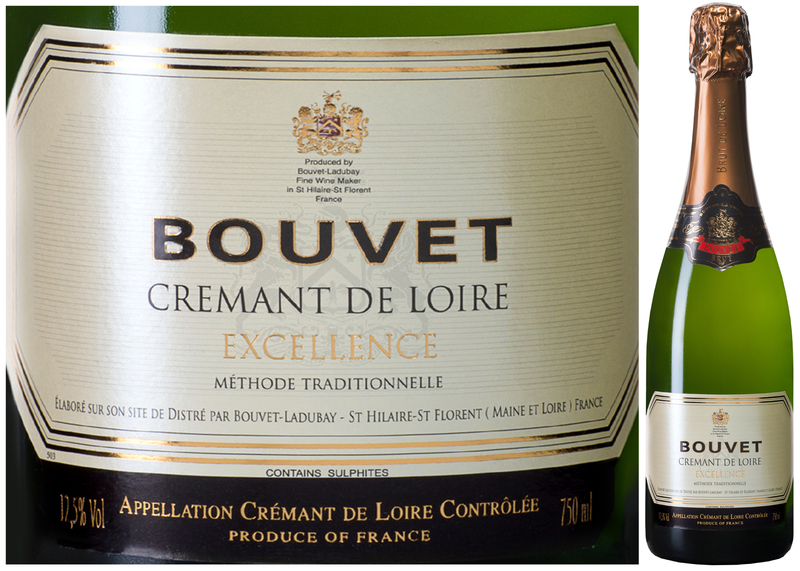 Moreover, the latter is further distinguished as 3 zones of unique terroir, whose vineyards sprawl along the valley slopes and banks of a meandering Loire River: Touraine, Anjou and the most prolific of all, Saumur – the fertile source for this week’s DéClassé featured Bouvet Brut Excellence. It’s an ebullient assemblage of mainly Chenin Blanc, the region’s flagship grape that’s also known as Pineau de la Loire, and a splash of Chardonnay, a migrated variety that’s often generically referred to as white Burgundy – here contributing added depth and softness to the wine’s body, mouthfeel, and range of aromas. Aged in the winery’s deep limestone cellars, these wines must be left to mature in the bottle for a minimum period of 12 months. However, as is the typical case with the finishing of non-vintage crémant (or Champagne, for that matter), the vintner is free to incorporate a dose of stored wine from a previous harvest into the final blend – thereby better ensuring the year-to-year consistency of the brand’s intended character and flavour profile. So, as you delight in this expertly made, dimensional and bubbly offering, see if you can experience some hinting references to the land and the prideful culture from which it comes. If you can’t, then be satisfied with having picked up several bottles of extraordinary value in Loire Crémant wine making. This is a particularly zesty, pale golden-amber, crisp and dry sparkler with a fruit and honey bouquet – and some surprising berry flavour notes in among the expected apple, pear and citrus. Try this as a spritzy apéritif with soft cheeses, charcuterie and hors d’oeuvres or with seafood and freshwater fish.